Max. User Weight: 250kg (Flat position). Suitable for dumbbell and barbells workouts. The JLL multi workout adjustable incline weight bench is ideal for sit-ups, abs and dumbbell training and many different home training exercises. It can be set to different positions from flat to 90 degree angle incline. It has strong, durable upholstery and would look great in any home! 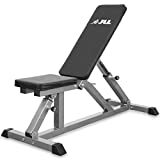 Posts related to JLL® Adjustable Incline Weight Bench Multi-function fitness bench, Heavy duty steel construction, Adjustable Incline Home Exercise Equipment.